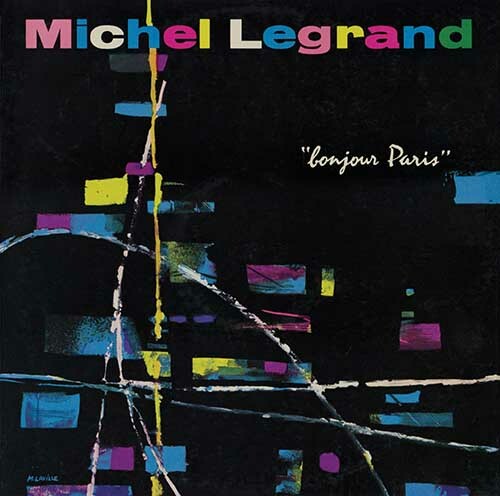 Recorded in 1956 Bonjour Paris is Michel Legrand’s first musical homage to the French capital. It’s an exciting and precocious work, free of clichés. A breath of fresh air. One senses the urgent young musician eager to master every musical discipline; concerts, records, radio, playing piano, con-ducting, singing, composing, classical, playing jazz. • Recorded in 1956 Bonjour Paris is Michel Legrand’s first musical homage to the French capital. It’s an exciting and precocious work, free of clichés. A breath of fresh air. One senses the urgent young musician eager to master every musical discipline; concerts, records, radio, playing piano, con-ducting, singing, composing, classical, playing jazz. • For all of the versatility and eclecticism Legrand has displayed over a long career, his name is synonymous with cinema. He was to the French New Wave, what Joan Miró was to the surrealists. His music anchored their films. They need his art. Une Femme est une Femme and Vivre sa Vie for Godard. Cléo de 5 à 7 for Agnes Varda. Lola, Les Parapluies de Cherbourg and Les Demoiselles de Rochefort for Jacques Demy and Le Joli Mai for Chris Marker. • Legrand’s music for Le Joli Mai (The Lovely Month of May) is the second feature of our presentation. The film has been described as “A far-reaching meditation on the relationship between individual and society”, Marker’s documentary being a portrait of Paris and Parisians shot during May 1962, soon after the ceasefire between France and Algeria, the first time since 1939 that France was not involved in any war. • Legrand’s score is accompanied by a breezy theme song performed by Yves Montand. • Retaining the Parisian theme, our edition is completed by selections from Michel Legrand’s Rendez-vous A Paris, which re-visits the musical landscapes of the city but now with a spruce 1960s perspective. 23. C'EST MAGNIFIQUE FROM "CAN-CAN"